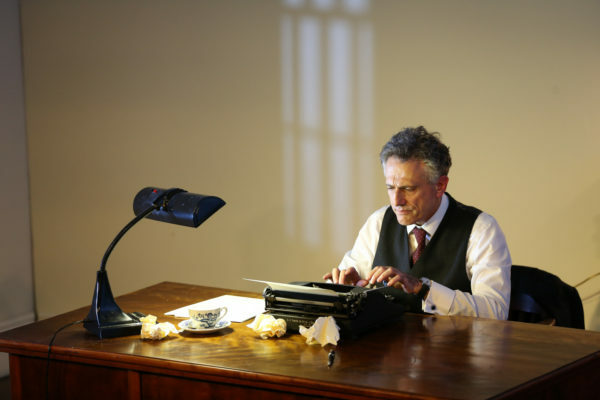 Patrick Maley reviews David Greenspan’s marathon solo performance of Eugene O’Neill melodrama. Eight characters, each racked by blinding psychological turmoil; a script spanning nine acts, twenty-five years, and roughly a gillion lines; one actor; six hours: David Greenspan’s solo rendition of Strange Interlude is at once a remarkable feat of human endurance and wonderful theater. Together with director Jack Cummings III, Greenspan has fully realized each of Eugene O’Neill’s complex characters and successfully gives them all deep, rich renderings. Enormously long though the show certainly is, the evening proves rapturous. Strange Interlude, which in 1928 won O’Neill his third of four Pulitzer Prizes, is in many ways the writer’s effort to craft a novel for the theater. Frustrated by limitations of dialogue and conventions of staging, O’Neill’s desire to achieve greater psychological depth lead him to the creation of long, meditative internal monologues for each of his characters. Within the dramatic world of the play, a significant portion of the lines exist in the minds of the characters as they ponder their own troubled existence vis-à-vis the other people in their lives who weigh so heavily on their desires. The drama unfolds around Nina Leeds (Greenspan), who opens the play psychologically scarred by the death of her fiancé, killed in war before the two could marry or consummate their relationship physically. To the distress of her father, Professor Leeds (also Greenspan) and close family friend Charles Marsden (Greenspan too), Nina announces her plans to leave home and work at a far-off veterans’ hospital. When she returns a year later, the Professor has died, Nina is a changed woman, and she has in tow two men she met in her travels, Ned Darrell (still Greenspan), a doctor from the hospital, and Sam Evans (yup: Greenspan), an old buddy of Nina’s dead fiancé. To various degrees, each of these three men long for Nina’s hand, and much of the play’s subsequent drama involves a life that ties these four people together by forces of desire and codependency. Greenspan’s performance of all this murky psychodrama is thorough and meticulous. Every gesture, every intonation, every step he takes around Dane Laffrey’s inventive set design (thoughtfully encompassing three different spaces over the course of the evening) smacks of careful and purposeful planning with a view to the best means of accessing each character. Because of the significant internal monologues, Greenspan in fact has to play all the characters twice—once as the person they allow to be seen, and again as the person with thoughts they dare not share—and whether the character is a woman, man, or petulant eleven-year-old child, this stunning performance brings them all to life. Wearing the same sharp, three-piece pinstripe suit over the entire production, Greenspan signals his movement from character to character with modulations in his tone of voice and mannerisms distinctive to each of O’Neill’s creations. There are no histrionics here, no rushing back and forth as characters converse, no trademark hats or glasses or props to mark out a character. There is only smooth, elegant movement within and throughout the winding corridors of O’Neill’s script. The opening act that features Nina’s announcement to her father of her decision to seek employment at the veterans’ hospital is coupled with wrenching pain in the minds of the characters as the Professor, Nina, and Marsden all wrestle with demons that eventually explode to the surface. It is a scene marked by huge emotional swings, painful revelations, and the determined emergence of conflicts long held in abeyance. Under normal circumstances, the scene would tax three performers, but here Greenspan takes on and gives passionate voice to layer upon layer of turmoil, seemingly laying himself bare less than forty-five minutes into his marathon. “Pace yourself, man!” one wants to scream. But even his playwright’s deepest, most raw emotion cannot drain the unflagging endurance of Greenspan. The melodramatic play is overfull of psychological swings, a roller coaster that Greenspan conducts confidently and masterfully. Strange Interlude runs to November 18, 2017. More production info can be found here.